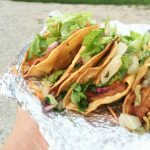 Happy Taco Tuesday, guys! 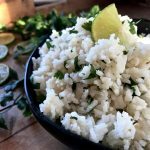 Let’s talk bout CILANTRO LIME RICE TODAY! Okay, let’s just get down to business guys. This Cilantro Lime Rice is the DANG BEES KNEES. I really love it, a lot. 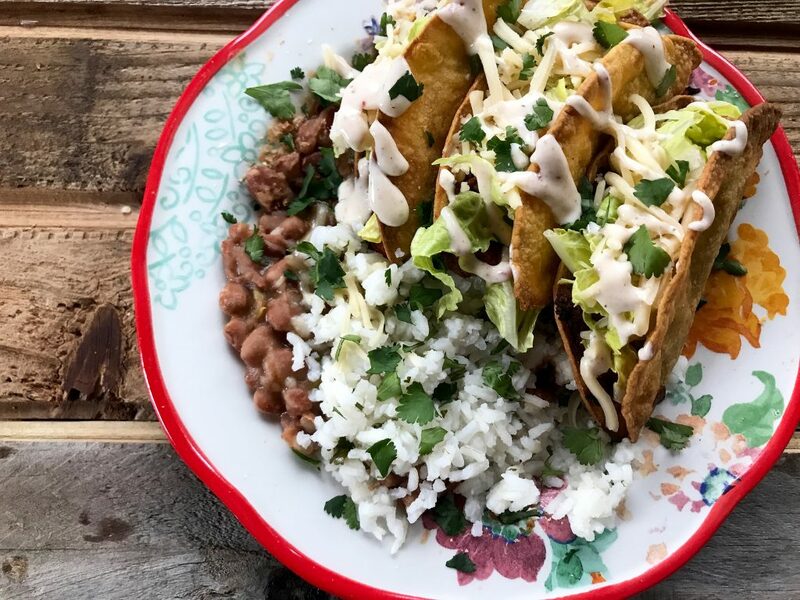 I’ve been perfecting this recipe for the better half of a year to be honest, but I finally did it just in time to post all about these homemade Chicken Burrito Bowls I’ve got comin’ attcha this weekend! On Sunday I got the Quick Chipotle Pinto Beans up, today I’ve got the rice, stay tuned for what’s next this week! 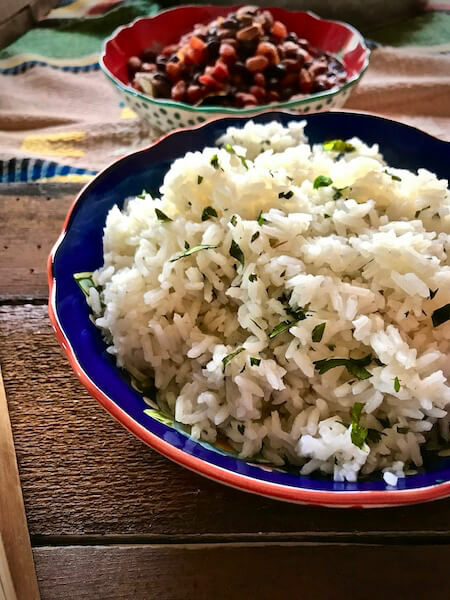 Let’s get in the kitchen and talk about this rice and all the “secret” ingredients in it that you would have never thought would go into something with a name that is seemingly so straight forward. There’s more guys. 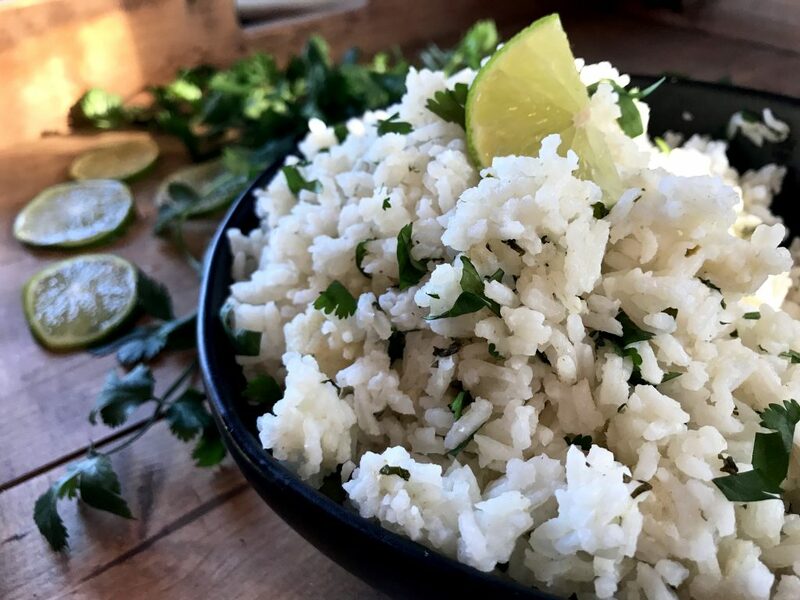 I mean, I don’t know if there’s more in all cilantro lime rice recipes, but there’s more in this one and it’s what makes it perfect. You’ll love it! Neeeext, let’s bring 4 cups of water to a rolling boil, shall we? 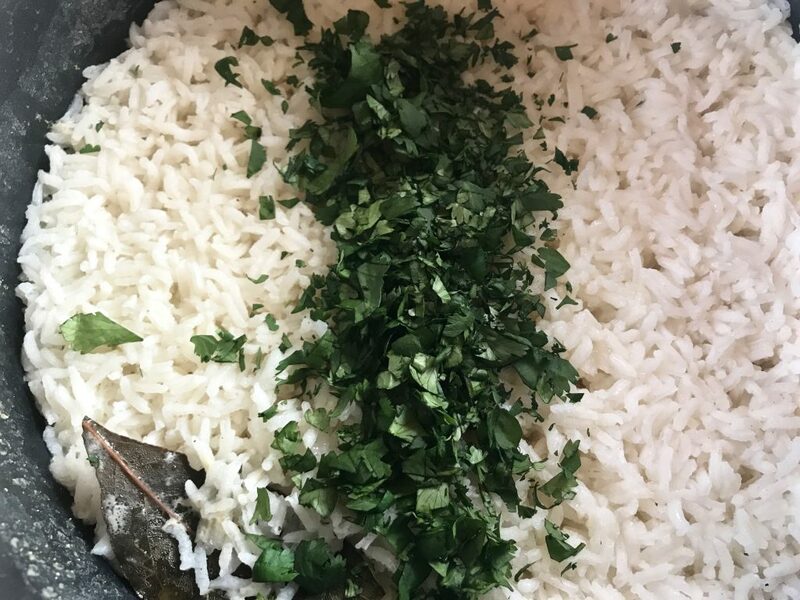 When the water is boiling you’ll want to add the following goodies: 2 cups of regular long grain white rice (not instant, not brown) one bayleaf, 1 tsp cumin, 1.5 tsp olive oil, and 2 tsp kosher salt. Stir it all in. Reduce heat to low. Cover and continue to cook for 15 minutes. The one “secret” I know that Chipotle does to make their cilantro lime rice so delish is to add a bayleaf. I don’t know how much of a secret it actually is, but yes, you sure do need that bayleaf! Also the cumin? That’s my own lil’ personal touch. I think it add SO much to the rice, but I don’t think it’s very traditional. That’s alright though! I’m not known to follow many traditional methods. If you want to use brown rice or another type of rice you’ll need to adjust the amount of liquid and the cooking time. While the rice is cooking finely mince about 1/4 loosely packed cup full of cilantro. Be sure to remove all the stems and just use the leaves! Mmmm.. 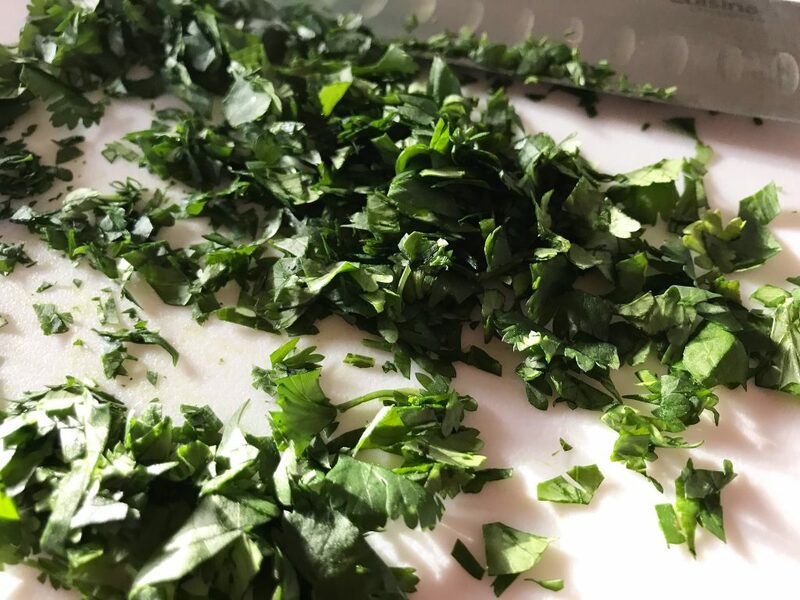 I just love the smell of freshly chopped cilantro. It reminds me that I’m about to eat somethin’ real good! Now, grab your lemon and lime and juice’m. Trick to get the most juice out of’m? Pop’m in the microwave for bout 15 seconds and then roll’m on the counter a few times. You’ll need half a lemon (about 2 tbs) and one lime (about 3 tbs). 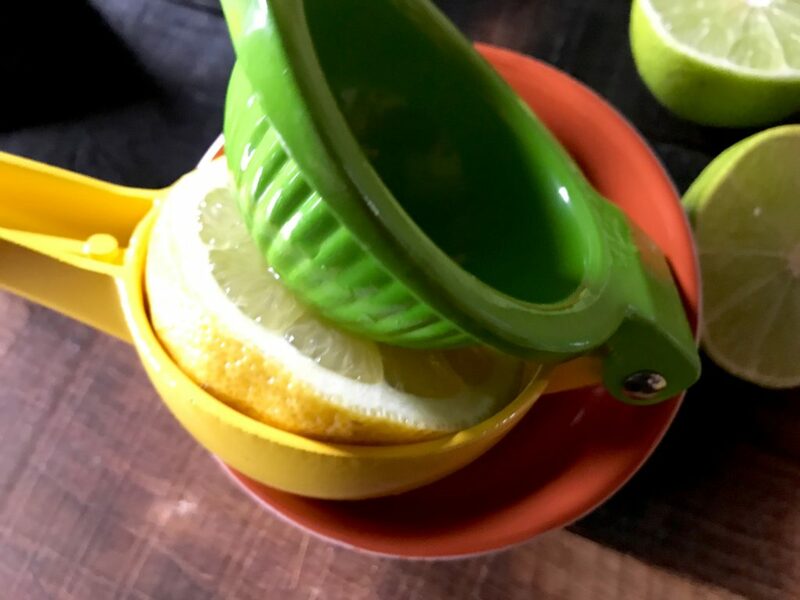 Why lemon AND lime? Honestly, just lime is too strong. The lemon balances it out. 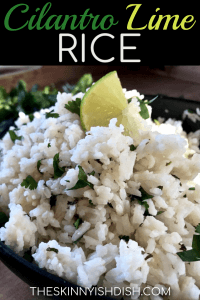 When the rice is done, Add the cilantro, lime and lemon juice, and 1/2 tsp kosher salt (or to taste!). Remove bay leaf. 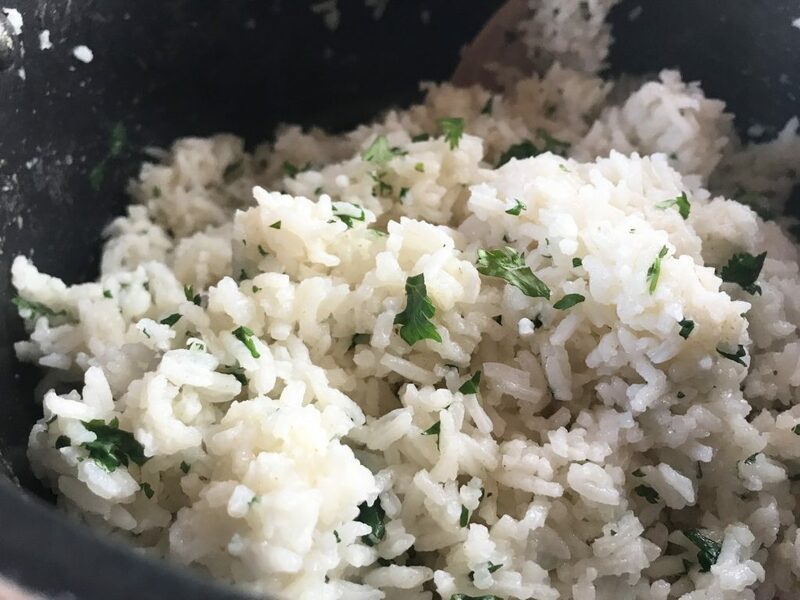 Fluff rice with fork and lightly stir the cilantro in until combined. And that’s it! So easy, right? It’s just so good! I really think cooking it with the cumin and bayleaf just makes it. 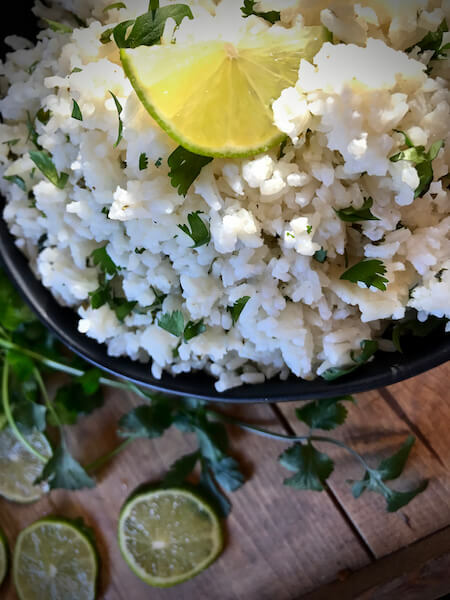 This rice is not only the absolute PERFECT addition to the burrito bowls that I’m going to show ya how to make later this week…. 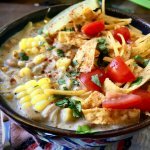 It makes my recipe for Crockpot Creamy White Chicken Chili even better! Remember this, y’all? 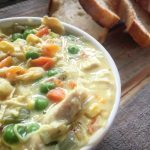 This might be my most popular recipe to date. 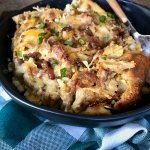 If you haven’t made it up yet… you’ll need to do that and pile it on top of this rice because it’s just all so yummy together! 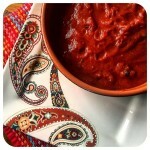 AND the tacos are drizzled with some magic, otherwise known as, my Southwest Chipotle Ranch- click for recipe! Now, remember to stay tuned this week. 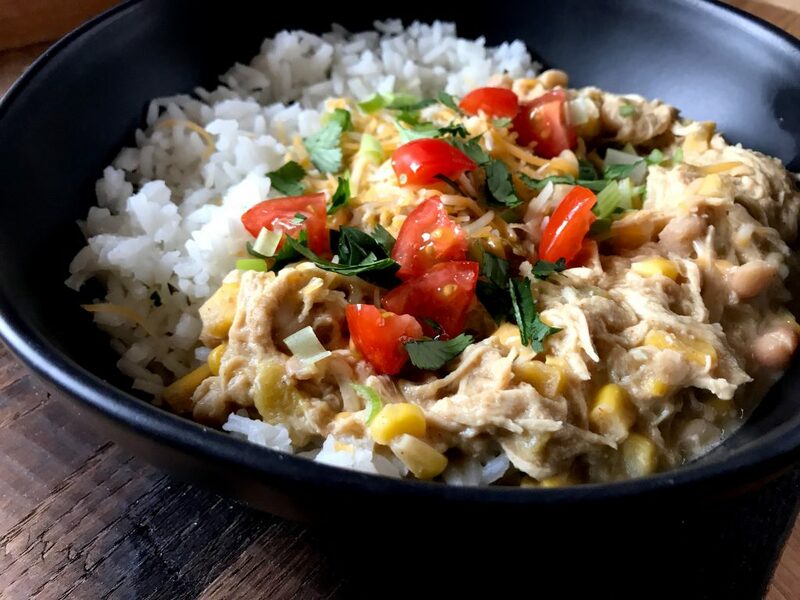 I’ve got two more recipes for ya to make a show stoppin’ homemade Chicken Burrito Bowl! You’ll never want to eat anything else ever again after you make these. Ha! Just kiddin’… I’ve got plenty of other recipes. 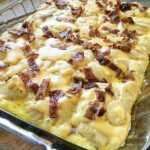 Now go make some of this! I really hope ya love it. 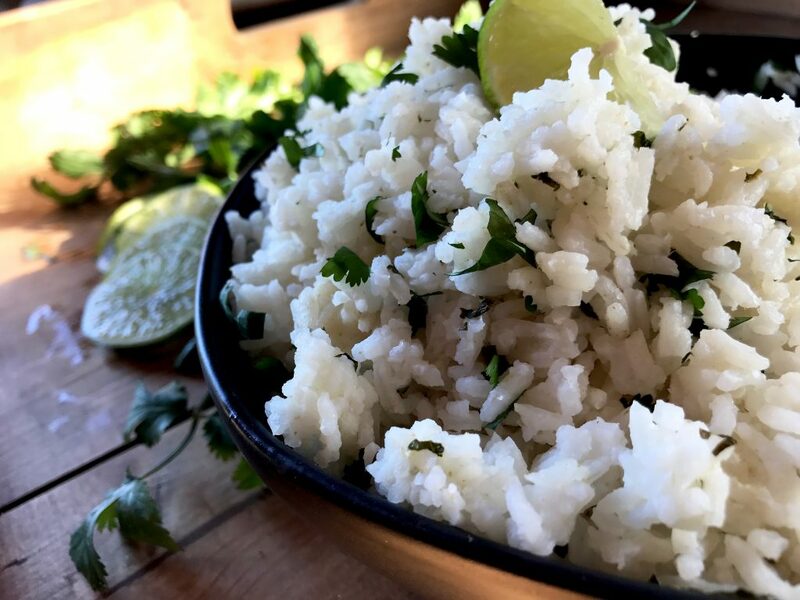 Fluffy, flavorful rice with a touch of lime, cilantro, and other spices. 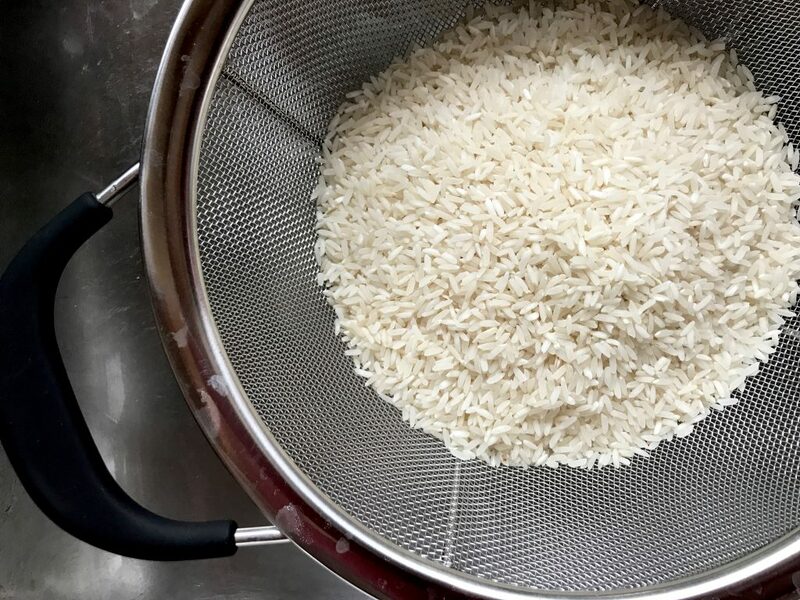 Rinse rice in mesh strainer to remove starches. This will help rice be a little more fluffy and a lil less mushy. Bring 4 cups of water to boil in a large pot. 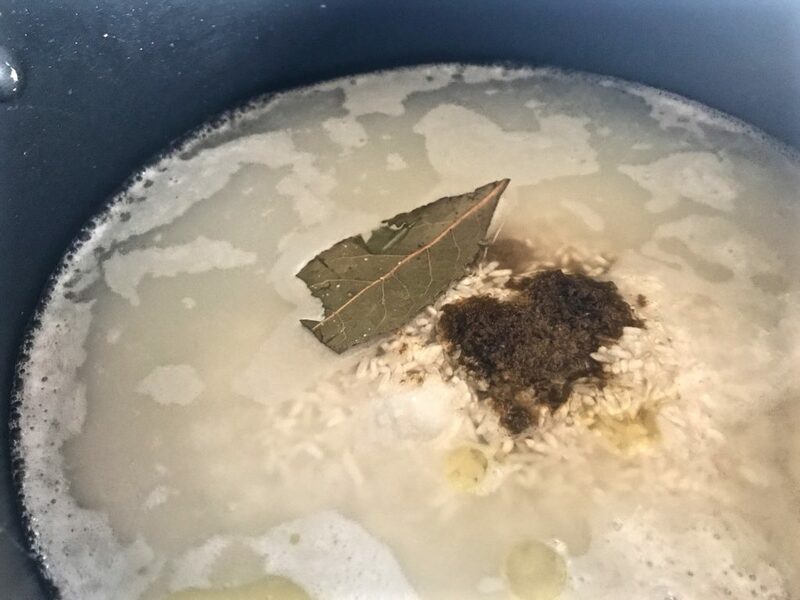 When water is boiling stir in rice, 2 tsp kosher salt, cumin, bay leaf, and olive oil. Reduce heat to low. Cover and cook for 15 minutes. Remove bay leaf. 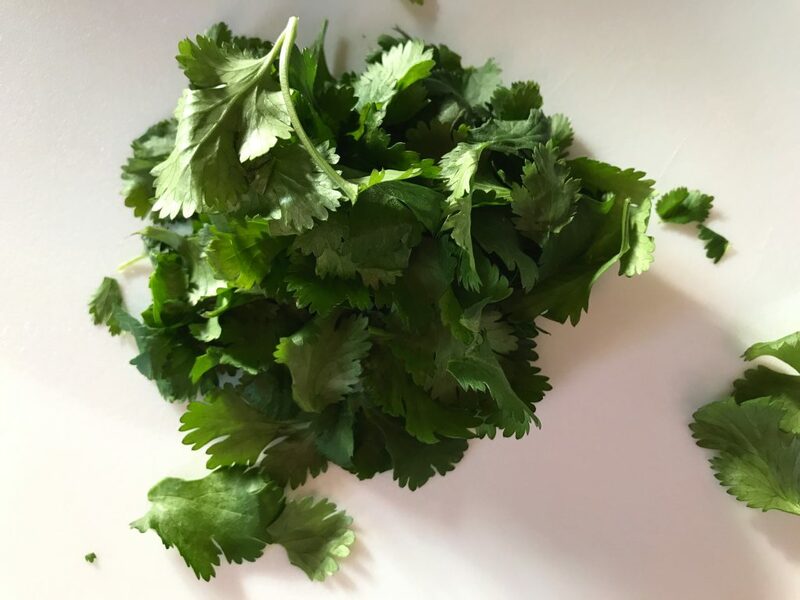 Fluff with fork and stir in cilantro, lime & lemon juice, and 1/2 tsp kosher salt. (or salt to taste!) Enjoy! Holy Moly!!!!! I spent the weekend preparing this rice with the chicken and beans…it is beyond description…so delicious! My hobbies said he was in love! whooohoo! So happy you enjoyed the whole sha-bang! 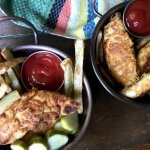 Why do you use kosher salt instead of table salt? I made this tonight and it was fantastic!! It needed no tweaking. I will definitely make this again and again.. 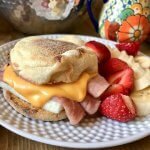 Thanks for sharing your great recipes! Yummy! 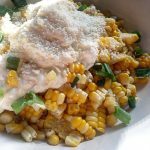 I did this in my instant pot with brown rice! Added cumin and bay leaf while cooking, other ingredients after. 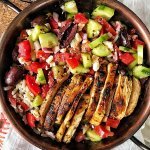 Perfect rice, great recipe! You’re a genius!